9.55 Maria Ralli (National Technical University of Athens) E-Space Portal/WITH federated search functionality for (re-)use of cultural content. 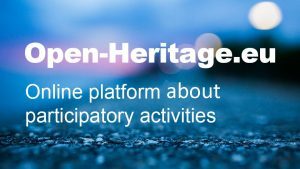 CrowdHeritage: CrowdSourcing Platform for enriching Cultural Heritage assets. Neil Forbes is the Associate Dean, Research, within Coventry University’s Facility for Arts and Humanities and is also a Professor of International History. His research interests and publications lie in the fields of Cultural Heritage (conflict, contested landscapes and the memorialisation of war), the interaction of foreign policy formulation with the practices of multinational enterprise during the interwar years, the processes of financial stabilisation after the First World War, and Anglo-American relations and the rise of the Third Reich. He has played a leading role in several research projects, including a £1m digitisation and creative archiving project in association with the UK’s BT and The National Archives, and was the Coordinator of the highly commended FP7 RICHES project - Renewal, Innovation and Change: Heritage and European Society, and has now assumed the same role for the H2020 REACH project. 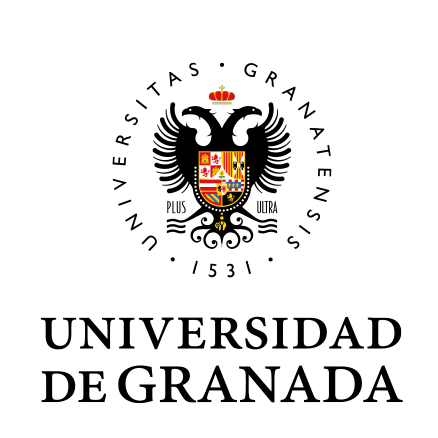 He is a member of several professional associations and other bodies and is also involved with the 50’s in Europe: Kaleidoscope project. Sarah Whatley is Director, Centre for Dance Research. Her research focuses on the interface between dance and new technologies, dance analysis, somatic dance practice and pedagogy, and inclusive dance. The AHRC, the Leverhulme Trust, Wellcome Trust and the European Union fund her current research, which is broadly focused on the impact of digital technologies on tangible and intangible cultural heritage. She led the AHRC-funded Siobhan Davies digital archive project, RePlay, and has worked with Davies on other artist-led research projects. She is founding Editor of the Journal of Dance and Somatic Practices and sits on the Editorial Boards of several other Journals. She was the Project Coordinator of the EC funded Europeana Space project. Sarah supported the development of the Routledge Performance Archive in her role as Academic Consultant: Digital Environment. She was an assessor for the 2014 REF exercise (Panel D35) and is a Strategic Reviewer and member of the AHRC Peer Review College. She is also an Evaluator for the European Commission that was considered to have been Outstanding. Maria Ralli is a graduate of the School of Electrical and Computer Engineering of National Technical University of Athens (NTUA). During her diploma thesis she studied and developed novel technologies and tools for the automated analysis and routing of public transportation networks. In the last three years, she has been working as a software architect and developer for the Intelligent Systems, Content & Interaction Lab of NTUA. She participated in several European projects about managing and reusing the digital cultural heritage of Europe such as EUscreen, EUscreenXL, Europeana Fashion, Europeana Sounds, Photography and E-Space. She has authored code for MINT and participated in the design and implementation of many core features of WITH, working with various Database and Web technologies both on the backend as well as the frontend. She is responsible for writing and reviewing code, packaging and testing the software and ensuring the overall quality and robustness of the lab’s end products. The focus of Charlotte Waelde’s work lies at the interface between intellectual property law (particularly copyright) and changing technologies, the changes in the law wrought by those technologies, and the impact that those changes have on the way that the law is both perceived and used by the affected communities. Her work reaches out into other domains including intangible cultural heritage, human rights, competition law, international private law and the regulation and promotion of new technologies more generally as they intersect with my core interests. Daniel Ockeleon is the CTO and city planner of Springfield at Noterik whose products are based on software framework called Springfield WebTV, a name derived from the popular TV show The Simpsons. Daniel’s role is to plan the different WebTV services in Springfield, which are named after characters in the TV show and form the core of our products. Daniel has been involved with the Dutch part of the Internet since the late 80s with activities ranging from providing email from his bedroom (BBS) to helping early ISP’s (xs4all). He was also CTO of the Dutch television broadcaster VPRO, and the original developer of the once popular OpenSource CMS MMBASE at a production company called Submarine. Daniel has trouble keeping his private pleasures (music and movies) out of his work which has resulted in his involvement in platforms like 3voor12 and www.cinema.nl. He represented Noterik within Europeana Space, the project that led to the development of the Pop-up Museum. Graham Black is currently celebrating 45 years of working in and with museums. Today he combines his role as Professor of Museums Management and Interpretation at Nottingham Trent University with consultancy. This combines his commitments to visitor participation and inclusivity with his belief in the need for academic rigour. His consultancy feeds through 'live' projects used in MA teaching. At undergraduate level, he contributes to core history modules at levels one and two. He is currently exploring the issue of how best to evaluate history museums in the 21st century and has published two books, both ‘bestsellers’, The engaging Museum (2005) and Transforming Museums in the 21st Century (2012). For the past two years, he has researched a new book The Museum Experience in the ‘Age of Participation’. Richard Tomlins is an Assistant Professor at the International Centre for Transformational Entrepreneurship, Coventry University having taken a full-time role in academe again following successfully running Cohesia since 2005. Richard’s work involves creative economy, social value and entrepreneurial innovation, community cohesion, regeneration, equalities and social inclusion as well as driving business and social gains through commissioning, procurement and social impact measurement. He is well known for innovative and ground-breaking consultancy, training and research, for example working directly with communities including his ground breaking work on the social action research model. His work in Coventry includes as former a Trustee of Coventry Artspace and former Trustee and Chair of the Tin Music and Arts. Richard was a part of the bid writing team, notably around social value which has successfully delivered the title of UK City of Culture for Coventry for 2021. His wider creative economy work includes creative economy scoping at multiple locations in Brazil in 2017; Sprint business planning at multiple locations for the creative economy in Brazil in 2017and 2018; and his (brief!) 4 volume guide to Sprinting the Creative Economy for British Council Brasil in 2018. Sally Hartshorne is in the final year of her PhD at the Centre for Urban History at the University of Leicester. Her research investigates heritage and urban development in Leicester since the Second World War. She has worked as a researcher on two Arts and Humanities Research Council projects focussing on Leicester’s Cultural Quarter and was part of the organising team for Planning Leicester: Town Planning and the Historic Environment since the 1960s, held in 2016. She is a member of Leicester City Council’s Conservation Advisory Panel. Prior to commencing her PhD Sally worked with creative and cultural organisations throughout the country on training and business development issues. Antonella Fresa - ICT expert, Director of Design and General Manager at Promoter SRL, has been working on European cooperation projects since the nineties. Since 2002, she has been Technical Coordinator and Communication Manager of national and European projects in the domains of digital cultural heritage, creativity and co-creation, citizen science, smart cities, digital preservation and e-Infrastructures. From 2002 to 2012, she was an advisor of the Italian Ministry of Cultural Heritage and Activities, technical coordinator of the Ministry’s EC funded projects on digitisation, and from its establishment until 2012 Member of the Concertation Table between the Ministry of Culture (MiBAC) and the Ministry of Research (MIUR). From 1999 to 2002, she was Project Officer by the European Commission in Brussels. She regularly serves as independent expert and evaluator for the European Commission. She is Vice-President of the PHOTOCONSORTIUM International Association for valuing photographic heritage and she is enterprise fellow at Coventry University, a founding member of IDEA - International Digital Epigraphy Association and Network Coordinator within the REACH project. REACH project has received funding from the European Union's Horizon 2020 research and innovation programme, under grant agreement No 769827. The sole responsibility for the content of this website lies with the REACH project.